Shanghai-based foodie and restaurateur Lindsey Fine (aka Veggie Mama) has been creating all sorts of delicious vegan recipes since moving to China eight years ago. You can read all about the perks of eating a plant-based diet via her blog Veggie Mama and sample recipes on this series, Cooking with Veggie Mama. 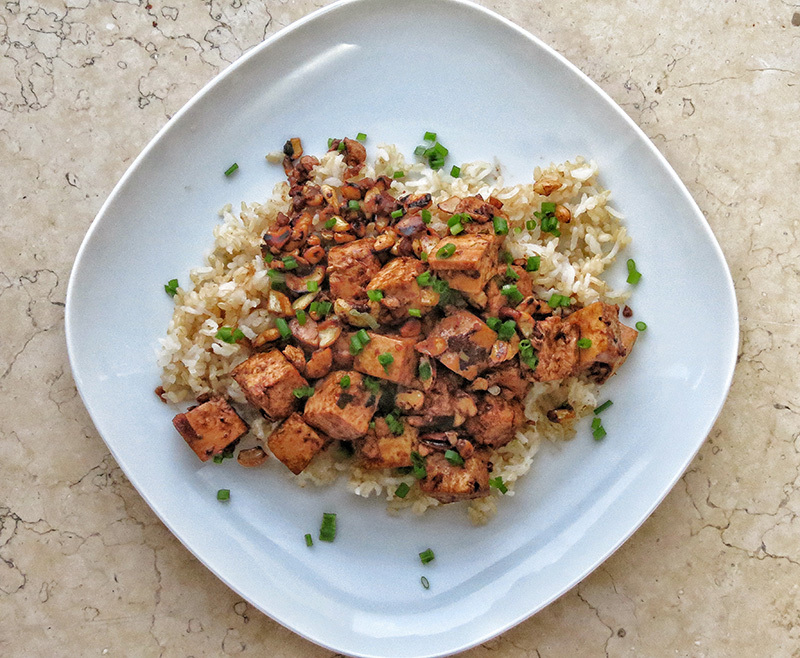 In this edition, Lindsey shares her recipe for Easy Cashew Tofu Stir-Fry. Cashew chicken is one of those dishes found in many American Chinese restaurants, but you’re not going to find it in a Chinese restaurant in China. That’s not to say it isn’t delicious or that it isn’t Chinese food, it’s just that in China people prefer to use sesame seeds or peanuts in savory dishes, not cashews. So if you’re American (or not) and you’ve got a craving for a healthy, meat-free version of this classic (American) Chinese dish, this recipe is a must-try. Not only are cashews delicious and a great source of protein but it’s totally possible to find them in China. In some cases, you can even get them at your local market. And to make this dish even more protein packed, I use tofu as the main ingredient. This recipe is delicious, flavorful and super easy to prepare. Serve it alongside brown rice or quinoa and add some steamed veggies for a perfect weeknight meal. 1. Mix vinegar, hoisin sauce, soy sauce and water in a small bowl. Set aside. 2. Toast cashews in a wok over medium-high heat until light brown, stirring frequently. Remove from wok. 3. Heat oil in wok and add garlic and white parts of scallions. Stir until fragrant. Lower heat if necessary so as not to burn the garlic and scallions. 4. Turn heat back up to medium-high and add tofu. Stir and heat for about 5 minutes until tofu is slightly golden brown. Remove from heat. 5. Add sauce to wok and bring to a light boil. Add tofu and mix well. 6. Add cashews and sesame oil and stir until mixed in. 7. Plate and top with green slices of scallion.